Spending several weeks in Italy, this past summer, made me realize how much I love fruits and vegetables. Produce found in the local markets depends strictly upon what is seasonal so you know you are always getting the freshest selection. Eggplants or Aubergine, as they are called in Italy, are at peak season between May and September. This is similar to Arizona where it runs May through November. This year our little backyard garden, produced an abundance of eggplant, almost more than we knew what to do with. After many hours perusing recipes online I decided to try my hand at a Timballo di Melanzane e Bucatini. I admit I was a bit skeptical at first on how this would turn out, but there was no need to worry. The timballo was delicious and made a wonderful presentation! Slice each one lengthwise into 1/4-inch-thick slices. Layer and salt the slices in a colander set over a bowl. Place a heavy bowl or pot on top of the slices to act as a weight. Allow the slices to "sweat" for at least 1 hour to remove the excess water. Rinse and dry the slices. Butter a 9 x 3 1/2-inch deep springform pan and coat the inside evenly with the 1/2 cup bread crumbs. Shake out the excess crumbs and refrigerate the pan until ready to fill. In a large saucepan, heat the olive oil over medium heat and add the onions, carrot, and celery. Cook until they begin to soften. Add the garlic and cook, stirring, until the garlic becomes fragrant. Stir in the tomatoes, red wine, and bay leaf. Cover the pan and simmer for 30 minutes. Season with salt and pepper and set aside. Remove the bay leaf before using. Cook the pasta according to directions. Drain and transfer to a large bowl. Set aside. In a medium-size bowl, combine the ground meat, egg, wine, 2 tablespoons grated Pecorino cheese, bread crumbs, and salt. Mix to combine the ingredients. Form marble-sized meatballs with your hands. Heat some oil in a large sauté pan and fry the meatballs until browned on all sides. Transfer the meatballs to the bowl with the bucatini. Add the mozzarella, parsley, and 2 cups of the tomato sauce. Stir to combine the ingredients and set aside. Rinse and pat dry the eggplant slices. Heat the olive oil in a large sauté pan over medium-high heat. Fry the eggplant slices a few at a time until they soften, about 2 minutes on each side. Drain the slices on paper towels. Add additional oil if the pan seems dry. Line the springform pan with the eggplant slices, draping them lengthwise and overlapping them up the sides of the pan. There should be about a 3-inch overhang over the top edges. Make sure there are no open spots in the base of the pan it should be completely lined with the slices. Fill in the bottom with smaller pieces if you need to. Spoon the pasta mixture evenly in the pan, packing it down with a wooden spoon all the way around. Fold the overhanging slices of eggplant in over the top of the pan; the mixture should be completely encased by the eggplant. Spread 1/2 cup of the remaining tomato sauce over the top of the mold and cover with aluminum foil. Bake for 45 minutes. Uncover, sprinkle on the remaining cheese and bake an additional 10 minutes. When the timballo shrinks a bit and a knife will easily move along the sides, remove it from the oven and let stand covered for 30 minutes. Remove the foil from the timballo and run a butter knife around the inside edges to loosen it. Un-latch and remove the side. Place the timballo on a serving dish. Cut the timballo into wedges and serve with additional sauce on the side. 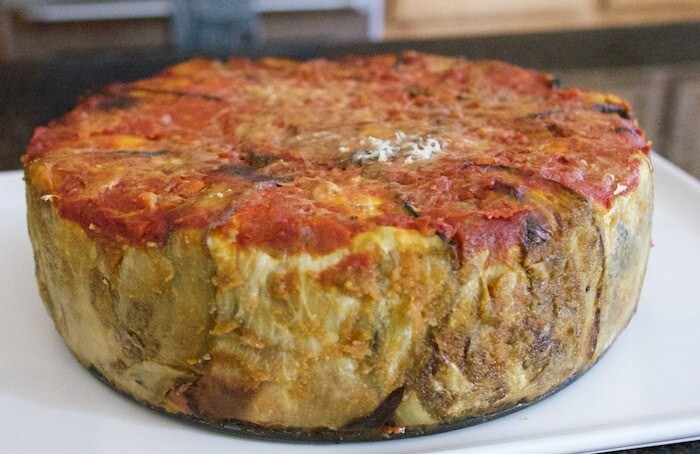 Caution: un-latching the timballo too soon will cause it to collapse. Ohmygosh!! I've never seen this dish before, but it looks and sounds like heaven! My favorite ingredients! Well done! I'm from Croatia and we love to eat lots of veggies and fruits so I totally understand your inspiration for this dish :) Eggplants are so healthy and amazing veggie. 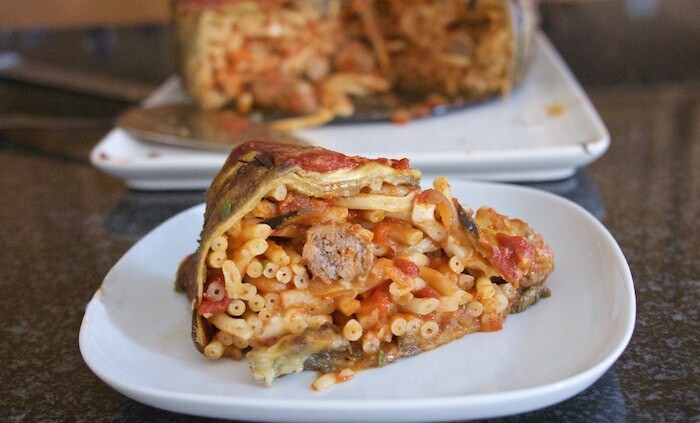 I never tried Timballo but it surely looks delicious. I love the flavours, the cheese and the wine pairing. Great recipe! This eggplant pasta looks fantastic. I have never heard about timballo before but now I am surely interested! Thanks! I have never heard of timballo but it looks so interesting!! Yum! This is so creative! I love all those vegetables! This looks so good! I love eggplant dishes! How lucky that you got to spend so much time in Italy!! I love eggplant and Bucatini so I need to give this a try! Is there anything better than cooking with fresh vegetables??? All of these layers! Looks amazing!